Below you will find our frequently asked questions. Please click on your question to activate the answer. If your question is not listed below please feel free to contact us and we will gladly answer any questions you may have. 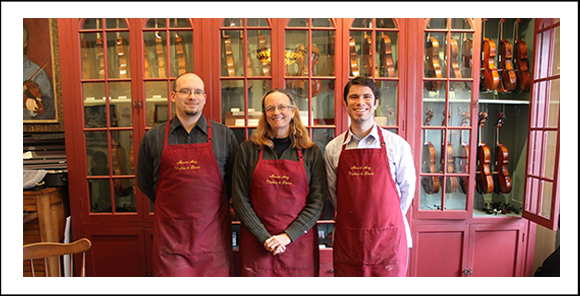 What are the advantages in renting from Mount Airy Violins & Bows over other stores? We are makers who understand how to set-up and properly adjust your instrument. Our instruments are a cut above. Our instruments are easier to play and well maintained. You build credit faster with us than any other music store. 100% of your rental fee can be used to purchase your instrument. We include extras, such as a shoulder rest sponge, rosin and music stand in our rentals. No long-term contract. You can stop any time after the first 3 months. 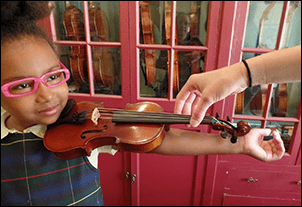 You and your child will receive free instruction on how to care for your instrument. 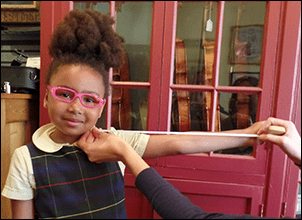 We love having the chance to get kids (and grown-ups) off to a good start in learning how to play a stringed instrument! What size instrument should I get? What does your protection plan cover? The protection plan covers smaller repairs such as broken strings, buzzing strings, open seams, stuck or broken pegs, etc. We’ll even help you out with tuning if you stop by. It does not cover rehairs or new strings which should generally be replaced once a year. It also does not cover lethal damage. For your ease of mind, we recommend that you add your instrument as a rider on your home insurance or purchase instrument insurance from an outside company (we can provide you with this information.) In the event that your instrument is lethally damaged, you will forfeit your deposit. What if my child outgrows their instrument? 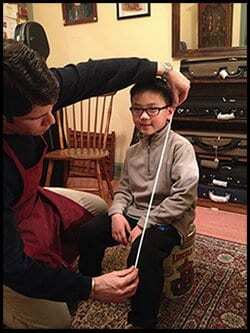 If your child outgrows their instrument we will happily help you to switch to a larger size. Don’t worry; all of your accumulated equity will transfer over to the new instrument! If he/she has been using the instrument for more than a year without a string change or re-hair, you will be charged a restocking fee to cover the wholesale cost of new strings and a re-hair. Do my monthly charges count as credit towards ownership? Yes, 100% of your “Rental Fees” can be applied towards the purchase of an instrument at any time as long as your account is in good standing. At the point when you’ve accumulated enough credit to purchase an instrument of equivalent value to your rental, we will let you know. You are welcome to continue to rent as long as you like, and continue to accrue credit (perhaps towards a more expensive instrument!) and enjoy our protection plan. Does my equity transfer over if I switch to an advanced rental? Yes, all of your accumulated equity will transfer over if you upgrade to a higher quality instrument. If something happens to the instrument can I bring it to my handy neighbor to fix? Absolutely not. Please make sure you bring your instrument in if you are experiencing any problems. What happens at the end of my rental term? At the point when you’ve accumulated enough credit to purchase an instrument of equivalent value to your rental, we will let you know, and you can purchase an instrument, should you desire to do so. At that point, we’ll apply your deposit and rental credits. You are also welcome to continue to rent as long as you like, and continue to accrue credit (perhaps towards a more expensive instrument!) and enjoy our protection plan. Continuing renters receive their deposit back, have access to wholesale re-hairs and strings AND nearly all repairs are taken care of by our staff at no cost.